The native people of New Zealand possibly suffered less in their relations with Europeans than many indigenous civilisations. But that didn't mean the interactions between Europeans and Maoris were entirely peaceful; in fact, they generated many legal battles, and plenty of written records, many of which can be found in the Maori Land Court. 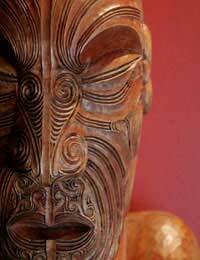 Before the arrival of Europeans, the culture of the Maoris was oral, and genealogies were remembered. Even today, most Maori families have one member who can recite all the genealogies, and the first step for anyone researching their Maori ancestry should be the family, which stands at the centre of everything. Until the Europeans arrived, the Maori didn't use surnames. Once they began, they adopted their own version of the patronymic, taking the father's first name as the child's surname, which meant that surnames changed with each generation. So, when researching, if you know the father's first name, you'll automatically know the child's surname. Since the early 1900s, however, you'll find that many Maoris have tended to take surnames in the European manner (keeping the same name from generation to generation), although a number have two surnames, one European, the other a transliterated Maori version. Prior to 1911, the only Maori marriages that had to be registered were those between Europeans and Maoris. After 1911, when civil registration became mandatory for Maori births, marriages and death (1913 for the last two), the records were segregated, marriages until 1954, births and deaths until 1961, when all the records were finally merged. You can obtain certificates or photocopies of entries from the Registrar General. Be aware, however, that with births, in the early years a significant number went unregistered. Genealogy, or whakapapa, is a vital part of the Minutes of the Maori Land Courts. Genealogy establishes both the title to land and its succession, but many of the concepts might seem alien to non-Maoris. You can find records of the Maori Land Court at the National Library, whilst the Minutes are available on microfilm at the various LDS Genealogical Library Centres in New Zealand. There are also some records at Archives New Zealand, including land records by title, and school rolls (some with photographs, so you might be able to see your ancestor). In the Auckland branch, the Archives also have the records of the Maoris who worked as gum diggers - which often meant many members of the same family. Although light on family history detail, you can discover when and where they worked, and how much they were paid. Apart from the Minutes of the Maori Land Court, the LDS genealogical libraries are an excellent resource for both whakapapa books, showing genealogies, and various family history records that have been transcribed by church members. There are several branches of the library in New Zealand.